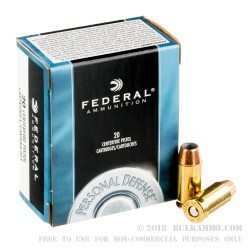 A solid choice for those who want premium pistol performance without the heavy price of the ultra-premium ammo offerings. 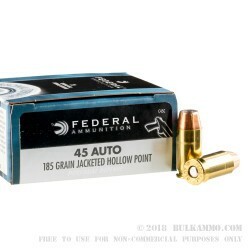 This load is more than capable of keeping up with the Jones’ with the 185 grain jacketed hollow point from Federal loaded into the top quality brass casing with the premium powder, and yet, it is much less than some of the heavily marketed “personal defense” lines. Yes there are a few small concessions, but in a well maintained, mainstream firearm in .45ACP, the changes in performance will generally be negligible, or will go unnoticed. 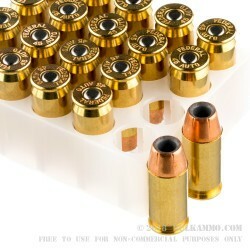 This cartridge features a brass cartridge casing, that has a Boxer primer, which can easily be reloaded. The Classic line projectile is a deep pocket hollow point that offers pretty consistent deformation and the reliability is beyond doubt. This is true of any Federal line. The 185 grain projectile moves at 950 feet per second velocity out of the barrel and generates 371 ft. lbs. of energy at the muzzle. This pits it squarely against ultra-premium options that cost nearly twice as much (some even more). 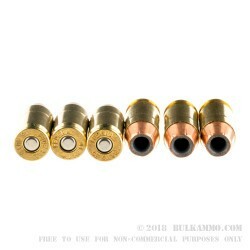 The substantially similar static ballistics and the quality and reliability of the Federal line make this an obvious option for those who don’t have to have all the bells and whistles to feel confident in their personal defensive ammunition choice. not as good as the prem. hp federal but 1 star below would buy again.